My favorite technology company, Tesla Inc. (Nasdaq: TSLA), launched its IPO back on June 29, 2010. The company priced shares at $17 each. Investors who want a pure play in the electronic vehicle (EV) space might do well to consider investing in a few shares of Tesla Motors. When I wrote that, Tesla shares were selling for $37.89 each. All you needed was a 300-share investment (about $11,000), and you would be driving a Tesla today. Tesla shares are up a blistering 706% ($305.52) since April 2013, as of this writing. That 300-share investment would be worth more than $90,000 today - more than enough to land you in the driver’s seat of Tesla’s Model S sedan or its Model X SUV. Plunk down a deposit on Tesla’s “inexpensive” Model 3 instead, and you’ll have more than half your $90,000 left over. So how can a car company that sold 76,000 cars last year have a market cap bigger than that of General Motors (NYSE: GM), which sold 10 million? That’s easy. Tesla has Elon Musk. And Tesla’s not a conventional car company. Comparing Tesla to conventional automakers is like comparing BlackBerry Ltd. (Nasdaq: BBRY) and Apple Inc. (Nasdaq: AAPL). BlackBerry didn’t have Steve Jobs. Jobs was a visionary. He saw 10 or even 20 years into the future. Elon Musk does the same thing. The ability to do that is truly a gift. Disruptive products like the iPhone and Tesla’s EVs aren’t things everyday folks or even everyday engineers come up with. You have to have the gift of foresight. And you have to believe that your disruption is going to change the world. Musk is constantly working on something new. That’s what visionaries do. They are at least 10 steps ahead of everyone else. Yes, you have to think that big. So what’s Musk thinking about now? EV semitrucks. I’m not making this up. Musk takes Fessler’s First Law of Technology (technology marches on) to the extreme. Musk’s latest disruptive product is an all-electric semitruck. It’s intended to replace the giant, loud, diesel-smoke-belching behemoths we fight with for road space every day. Musk calls his new truck “seriously next level.” If it’s as “next level” as his EVs are, the truck world is going to be turned on its ear. About a week ago, Musk tweeted out that Tesla’s electric semitruck will be unveiled in September. He said his “team has done an amazing job.” He also said Tesla will be unveiling an electric pickup truck in about 18 to 24 months’ time. How can Tesla possibly be working on a new semitruck, pickup truck, getting the Model 3 ready to manufacture, and rolling out nearly 2,000 new Model S and Model X vehicles every week? The answer is in the chart below. No, this isn’t a chart of Model S production ramp-up. It’s Tesla’s employee numbers, starting at its IPO in July 2010 through the end of 2016. You can bet that some of those early employees have become multimillionaires, given the appreciation of Tesla shares. Tesla now has more than 18,000 employees. The company’s Gigafactory, its sprawling battery plant outside of Reno, is already producing batteries for its cars and storage products. It currently has about 1,000 employees. That will rise to 3,000 when the facility is complete. Musk says that it will take about 100 Gigafactories spread around the world to supply enough batteries to meet the world’s transportation and energy storage needs. When completed, the Gigafactory’s annual production will equal the number of lithium- ion batteries made worldwide in 2013. The Gigafactory (and others like it) could end up being Tesla’s secret weapon. Tesla could end up being one of the world’s premier battery suppliers. With enough EVs, solar energy and battery storage, climate change won’t be an issue. And a lot of fossil fuels will remain right where they are: in the ground. 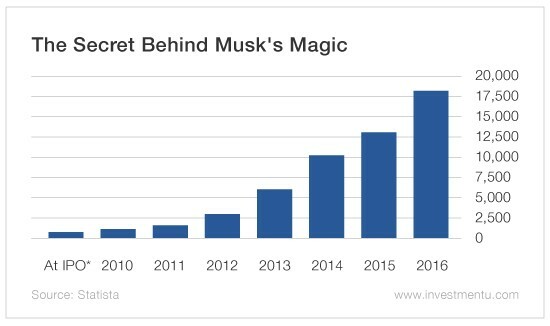 My advice is never bet against - but make sure you’re invested - in Elon Musk. P.S. If you'd like to read more about the energy sector from me and my fellow resources experts, click here and we'll automatically subscribe you to Energy & Resources Digest. It's free. Still not convinced it’s smart to bet on Musk & Co.? Dave recommends another company at the forefront of the technological revolution sweeping the car industry: Delphi Automotive PLC (NYSE: DLPH). 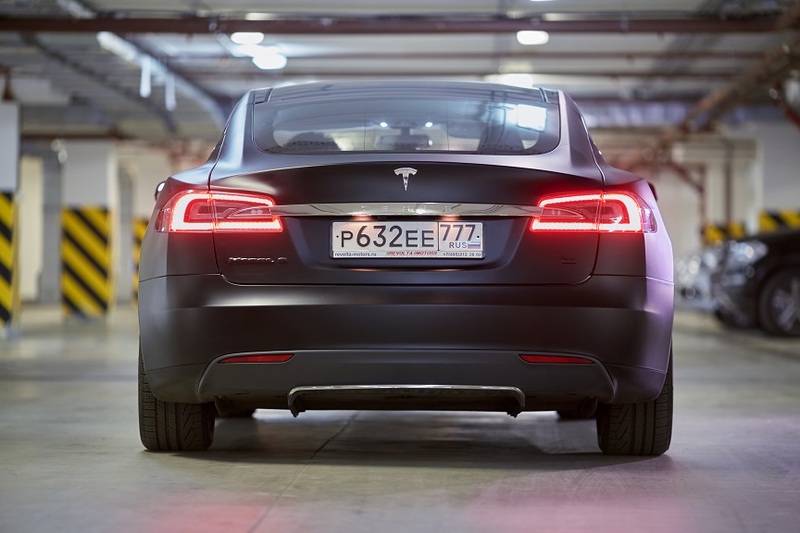 “In the automotive world, there’s more interest in vehicle automation than in cars. Almost every day, another new car commercial shows cars with new tidbits of vehicle automation. “Automatic lane departure warning, rear collision avoidance and emergency stop in both directions are now available on many car models. But this is just the beginning. “In a few years, we are going to start seeing fully autonomous vehicles on our roadways. And for good reason. “That reason is technology. I’ve always said technology marches on. “Last year, Delphi Automotive engineers sent an autonomous vehicle 3,400 miles across the U.S. It was in autonomous mode more than 99% of the time. “Vehicle automation is nothing new to Delphi. Fifty years ago, it developed the first cruise control system. The World Travel & Tourism Council expects the U.S. tourism industry to increase 2.3% this year to $1.5 trillion. “Now, Delphi is deep into the development of advanced driver assistance systems (ADAS). Present ADAS can detect some objects, classify them, alert the driver of dangerous road conditions and, in certain cases, slow or completely stop the vehicle. “The Delphi system includes many different sensors. When the system combines the inputs from all of them, it creates a 360-degree field of safety. “It’s important to understand the distinction between automated, autonomous and driverless. Automated is what’s available now. Autonomous is what Tesla claims it will have starting in 2018. Driverless is essentially the most advanced stage of autonomous. “To offer a completely autonomous solution, Delphi has teamed up with Mobileye N.V. (NYSE: MBLY). Mobileye has a best-in-class camera vision system. “It uses real-time mapping and vehicle location. Its system performs detailed interpretations of camera images. “Its cameras take a 360-degree image around the car. A high-speed in-car network sends those images to the multi-domain controller (MDC). “The MDC processes and identifies each image. But the best part of the Mobileye system is that it can learn and remember what it sees.